This entry was posted in Hazardous materials on 2017/09/06 by Susan. Not dealing with asbestos properly can result in fines or stop-work orders that can harm your professional reputation. A new WorkSafeBC video explains more. It is really worth the risk? That’s what WorkSafeBC asks construction contractors in the video Asbestos: Why risk it? It’s a reminder of their obligation to manage asbestos safely and responsibly. Exposure to asbestos remains the number one killer of people working in construction. The Asbestos Awareness for Contractors campaign is part of WorkSafeBC’s ongoing initiative to protect workers from occupational disease. To find out more about how poor asbestos-related safety practices affect reputation, I talked with Justin McConville. He’s the Hazmat Department Supervisor & Laboratory Manager with On Side Restoration. Chris Mitsche is a Construction Safety Officer and project manager with Enviro-vac. I also asked him how poor asbestos handling harms a contractor’s reputation. “WorkSafeBC’s whole goal is to protect workers in any trade. If you send workers into harm’s way without properly dealing with asbestos, as an owner or an employer, your reputation is damaged because you’re seen as an employer or owner that doesn’t take care of its employees or trades. All materials that will be impacted by a renovation or demolition must first be tested for hazards such as asbestos,” he says. As a restoration company, On Side is mainly hired by insurance companies. On Side has an excellent reputation and is “not the lowest bidder when winning jobs,” Justin says. But it’s a different story on many smaller projects. But attitudes towards asbestos are changing. Justin says WorkSafeBC is making good ground with projects like the hiddenkiller.ca website and increased enforcement. And the Asbestos Awareness for Homeowners campaign aims to educate homeowners on the role they play in keeping workers safe through their choice of asbestos contractor. I think and believe there should be standard of safety through out Canada and the government should infuse more funds to supplement more inspectors to monitor the activities of homeowners who do their own renovations on houses that were built prior to 1990. it appears the rules of safety are less followed as we get away from larger centers where there exist more worksafe inspectors? hygienist who will test for hazardous materials and provide results. During a massive commercial demolition we employed these professionals to cover out butts and provide us with guidance. I’ll be honest, it does put pressure on the bottom line, but I’d rather have a tough discussion with someone on my team than with a WorkSafe Officer. The next step is to hire an abatement contractor. Here is where things get dicey. It’s very easy for these contractors to hold you ransom all in the name regulation. Here is where the property owner needs to understand that at the end of the day they are the person in charge, accountable and responsible. We used two separate contractors for the two phases of our project. Both hired on a time and materials basis. Each of these two companies operated from each end of the spectrum. This is why it is important to have a third party represent you as mentioned above. There is a lot of material around on asbestos so read up and know the process. At the end of each day review the progress being made with your abatement contractor. Stick to the scope of work and revisit other work at a later date. In B.C. abatement workers get training and are supervised during the work. There are times that you may think it would be cheaper and quicker to disarm a bomb. There is no registry for abatement companies and no professional association, so it’s truly buyer beware. The regulations state that asbestos can stay in place when identified. It must be noted and procedures put in place for people or trades working around it. 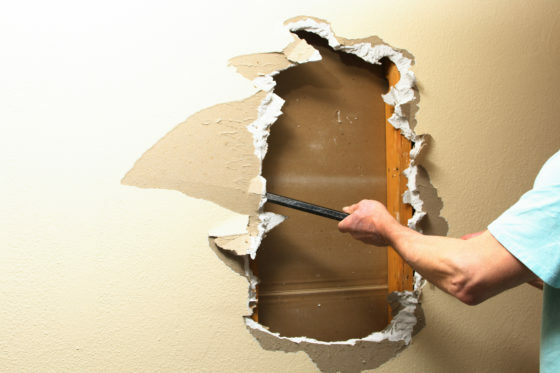 Drywall that has been identified can be covered over, but this will add substantial costs for removal at a later date. It is best to take it out now. If you have a large project, take the course and get your own gear. This way you will be knowledgable and able to properly supervise these companies. On a last note, you can check with WorkSafe to see if these companies are in good standing and if they have any charges against them. You may need to file a FOI, but the information is available. Don’t cheat, you will get caught.